"The Original" Muscle Ezze V40 Advanced! your product will be shipped to you and the recurring price will automatically be billed to your credit card. 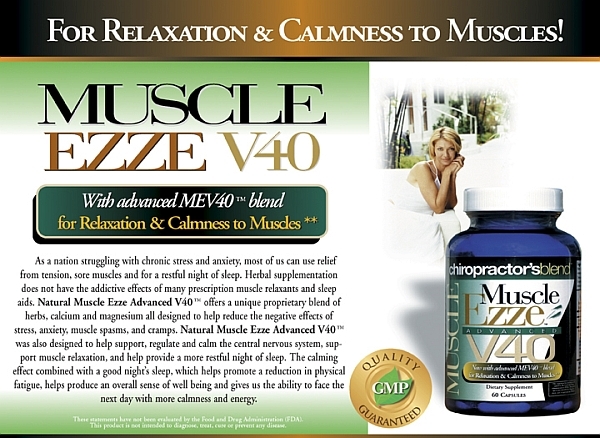 Natural Muscle Ezze Advanced V40™ offers a unique proprietary blend of herbs, calcium and magnesium all designed to help reduce the negative effects of stress, anxiety, muscle spasms, and cramps. and help provide a more restful night of sleep! The calming effect combined with a good night's sleep, which helps promote a reduction in physical fatigue, helps produce an overall sense of well being and gives us the ability to face the next day with more calmness and energy. Suggested Usage: Due to the potency of this product, we recommend taking Muscle Eeze V40 in a safe and controlled environment. Excessive consumption may impair one’s ability to drive and/or operate heavy equipment. 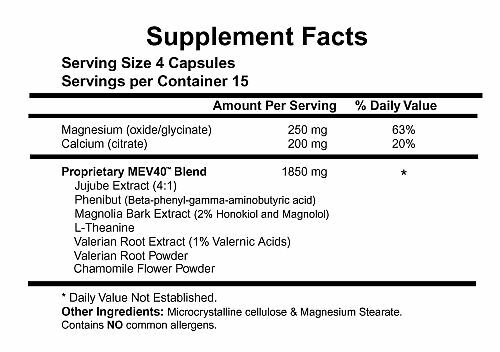 During times of stress, muscle discomfort, etc., begin with 2 capsules up to 2 times daily. To support restful sleep, take 4 capsules on an empty stomach with 8 oz of water 45-75 minutes prior to bed or as directed by your qualified health care provider. I get a lot of very painful muscle spasms and cramps and to my surprise this actually works! My muscles feel like jelly, like they have been floating in a warm saltwater ocean for hours...very relaxing! It truly works! It takes about 45 minutes for it to start working and all my muscle completely relax. The best part is that it is all natural ingredients, meaning in this case herbs. My chiropractor recommended this to me when I was having a hard time sleeping at night and boy did it help me sleep better.